• Firstly, we have to note for us fellow LPDs that most scholars date Sonnet 37 to the mid 1590s when Vere/Oxford found himself over 40! • Oxford was ‘lame’ since sustaining a leg injury in the 1582 fray with Sir Thomas Knyvet over the honour of his niece Anne Vavasour. • The street fighting between Oxford’s and Knyvet’s servants, including some deaths, resemble the Montague/Capulet dynamics in Romeo and Juliet. And just a bit more on King Lear: as with most of his plays, it was clearly a rework – likely at King’s Place, Hackney, during the Elizabeth Trentham Prospero/Tempest like 12 year exile from 1592 to Vere’s death in 1604 https://deveresocietyaustralia.wordpress.com/vere-letter-tempest-prosperous-gale/ – of Vere’s earlier The True Chronicle History of King Leir, registered in 1594; Lear/Leir [you can see the initial attraction of the name in the rhyme, especially with his preoccupation with being lame, and both surnames have 4 letters, Leir/Lear = L(ame V)ere; not to mention Tamburliane = Timur the Lame] had 3 daughters (and an illegitimate son) so did Vere; and both signed over their major estates to their daughters (Vere under pressure from Burghley, their grandfather); and there are clear parallels between Susan de Vere and Cordelia – Mark Anderson, p354 – the telltale ‘nothing’ lines re the de Vere family motto (Vero Nihil Verius = nothing truer than truth) in King Leir (c. 1594) / King Lear Redux and John Davies’ masque in Francis Davison’s Poetical Rapsody 1608; Warren Hope’s Lear’s Cordelia, Oxford’s Susan & Manningham’s Diary; and Nathaniel Baxter’s (was in Italy with Vere, also friend of Philip Sidney) poem Ourania about her father to Susan: “Vera Nihil Verius Susanna Nihil Castius” (Nothing truer than truth, nothing chaster than Susan). 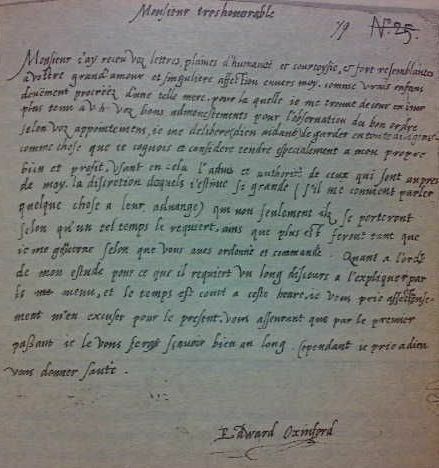 • Vere to Burghley, 13 July 1581 letter “…a shadow they can make a substance…” cf. 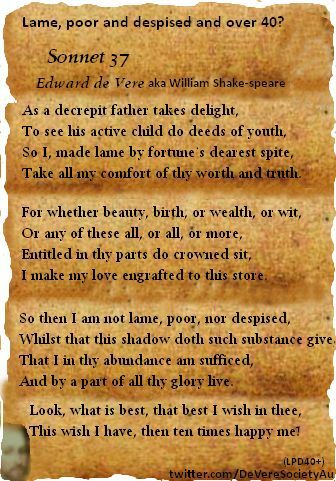 Sonnet 37 “this shadow such substance give“. 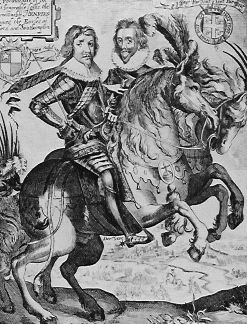 • In 1597 de Vere moved to King’s Place, Hackney (next to the London suburb of Stratford), he would die there 7 years later in 1604. It was purchased under the names of Elizabeth Trentham and her brother Francis, Edward being broke. At this time 4 year old Henry de Vere – his only son and heir after 3 daughters – was running around in his study. Elizabeth sold King’s Place in 1609. In that same year a William Hall (Mr W.H.) of Hackney no less (Hall also ‘procured’ A Four-Fold Meditation 1606 – same printer as Sonnets, viz George Eld) got his hands on the Sonnets… “OVR.EVER.LIVING.POET” is a tribute to a genius that is already dead (Willie Shaksper died in1612) but has become immortal. My very honorable Sir Sir, I have received your letters, full of humanity and courtesy, and strongly resembling your great love and singular affection towards me, like true children duly procreated of such a mother, for whom I find myself from day to day more bound to your honor. Your good admonishments for the observance of good order according to your appointed rules, I am resolved (God aiding) to keep with all diligence, as a thing that I may know and consider to tend especially to my own good and profit, using therein the advice and authority of those who are near me, whose discretion I esteem so great (if it is convenient to me to say something to their advantage) that not only will they comport themselves according as a given time requires it, but will as well do what is more, as long as I govern myself as you have ordered and commanded. As to the order of my study, because it requires a long discourse to explain it in detail, and the time is short at this hour, I pray you affectionately to excuse me therefrom for the present, assuring you that by the first passer-by I shall make it known to you at full length. In the meantime, I pray to God to give you health. And he was the nephew of Henry Howard, the father of the English Sonnet. Why would he need the Stratford businessman to write Sonnets for him? 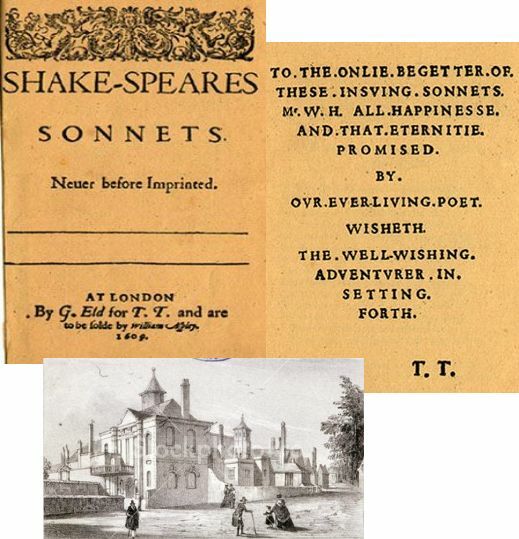 • The Sonnets really are a dead give-away that Edward de Vere is Shakespeare, even Stratfordians agree there were no Sonnets written later than 1604, the year de Vere died (cf. Willie Shaxper d. 1612). The structure of a sonnet is highly complex and mathematical. There are 14 lines in a sonnet. The first 12 lines are divided into 3 quatrains with 4 lines each. In the 3 quatrains the poet establishes a theme or problem and then resolves it in the final 2 lines, called the couplet. The rhyme scheme of the quatrains is abab cdcd efef. The couplet has the rhyme scheme gg. 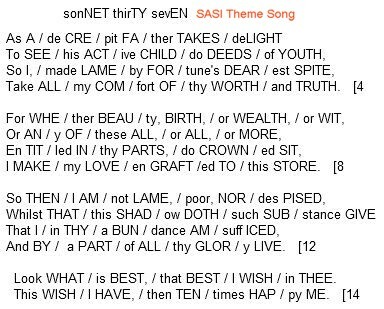 Each sonnet line consists of 10 syllables. The syllables are divided into 5 pairs called iambic feet. Obviously this composition requires a highly educated author, especially in Elizabethan times when 80% of the population was illiterate. There is no evidence Willie Shaksper, or any of his family, could read or write.